Aaron presented on social media as part of a Wichita Business Journal panel discussion this morning with three other local marketing personalities: Morgan Plummer from Lee Media Group, Emily Cox from The Arnold Group – Wichita, and Sean Amore of Value Place. We appreciate WBJ’s ongoing efforts to break the latest news about Wichita’s emerging technology scene, and we think the entire staff does a fantastic job. 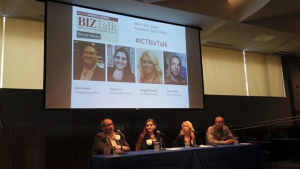 Follow the ongoing conversation on Twitter with the hashtag ?#?ICTBizTalk? !